It’s time to announce today’s winner of last week’s give-away for some luscious over-dyed threads from Colour Complements. There were heaps of participants in the give-away. It just goes to show you – we all like thread! Thanks for this wonderful opportunity! I like to stitch counted work, and have several projects on my to-do list which are perfect for these beautiful threads. Perhaps some ornaments with Algerian Eyelets, Satin stitch, or some hardanger in them. Or just would do some not-so-monochrome monochromes with my favourite color. Congratulations, KerGiz! Please drop me a line with your mailing information and email, and I’ll forward that on to Lorraine at Colour Complements. She’ll arrange the rest with you. I’m sure you’ll love the threads! 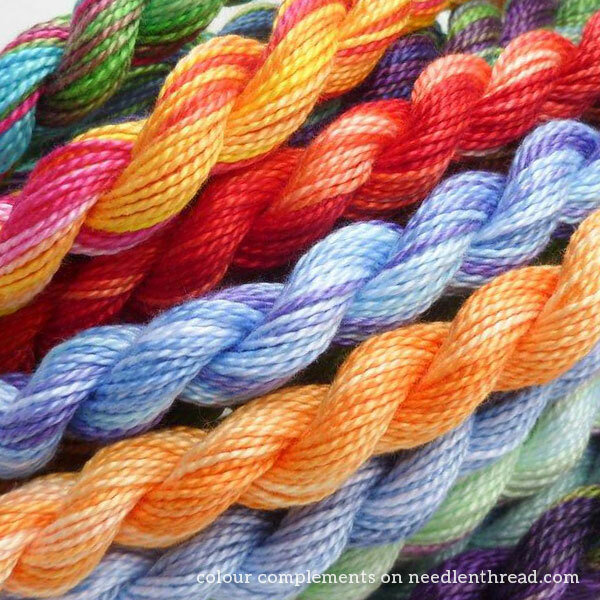 The thread sale is still going on at Colour Complements, so if you’re looking for some great over-dyed threads to add to your stash or play with on your current projects, stop in and browse! You’re sure to find a good fit! For those who have asked to hear how my Adventure with Cancer is going, here’s a personal update in letter form. I don’t really like talking about it on the website so that’s why I do it this way. For those who want to read it, please feel free. If you don’t want to, no worries at all! This weekend, I’ll be finishing up one stumpwork leaf and taking some photos of things like gorgeous threads, good books, and project progress! I’ll also be doing a bit of writing and hopefully soaking in some warm Kansas sun while enjoying the plethora of flowers (and bees and butterflies) in my front yard. Wherever you are, I wish you an equally splendid weekend! April 8, 2016 Oh Happy Day! An Embroidery Thread Give-Away! Mary, thanks for the update. And for all you do on this website. Best wishes for an easy last round of chemo and a full recovery. Thank you for the update. I hope this final treatment does the job and you are healthy and cancer free for a long long time. You’re in my thoughts and I’m wishing you well. Gracias por compartir la sabiduría aprendida a través de éste mal rato que la vida te da. Y tienes razón …todo pasa …nada es para siempre! Y pasa mejor cuando uno sonríe y acepta! Que Dios te llene de vida con salud!! Un apapacho afectuoso desde Puebla, México! I love to read your daily or frequent emails and your blog and to learn from you. My friend have always kept long term goals even during bad periods and it had helped her a lot. Thank you for your personal update, Mary. Your example of courage and faith never fails to lift my spirits. God bless you! Thanks for transparently sharing the personal update. I am still keeping you in my prayers. Félicitations pour votre courage face aux ennuis et merci pour les beautés que vous brodez ainsi que pour vos conseils ! Great give away – such elegant, sumptuous, and creatively inspiring threads! Thank you for your personal update in your AwC. Your letter should be added to the pantheon of classics detailing examples of how we might focus on our attitudes and our perspective to persist through adversity. And you are exactly right: we ought always to be kind because everyone we meet has burdens. Prayers for peace and wellness to you. Mary you are an inspiration, not just your beautiful embroidery, which I love, but your attitude to life at a very difficult time is amazing. I send my very best wishes for your complete recovery and thank you more than I can say for everything you do for us. Congratulations to KerGiz I hope you enjoy your lovely give away. Thanks Mary for the update on your illness I’m glad to see that you are being really, really positive about the cancer and treatment you are receiving. You are in my daily thoughts and prayers and thank you for the time you take to keep blogging for us and letting us know of your current and future projects as well as other web goodies. I do hope you have a restful weekend and hear from you next week. Take care and get lots of rest. So glad to hear that your treatments are almost finished and that they appear to be successful. Even though I am totally immersed in knitting and quilting right now, your blog is still one I read faithfully and you seem like a friend to me. I will be very glad when this trial is behind you and you are feeling totally well again. Congratulations KerGiz! Mary, have you heard about the new line of DMC Coloris thread? I received my e-mail this week that it is now available through Commonthread and I ordered the set. It looks like it will change colors more often than variegated which is what I’ve been looking for. Maybe I don’t know how to properly use variegated threads but I want a lot of color change when I’m doing a flower or a leaf and I just don’t get much with variegated. Hi, Sandra – yes, I have some already and I’ll be writing about it soon – with a little project! I ordered a set of Coloris the other day, and cannot wait to get my hands on it! Mary, Thanks for the introduction to Color Complements. And thank you for the update on your progress, treatment-wise. Prayers and good wishes to you during the next leg of the journey! Mary, thank you so much for the personal update letter. Your philosophy of our lives and their troubles could not be more beautiful, uplifting, and true. I know I’m just a follower of your blog…but I love you. Be well, dear one. Just a note to let you know I read most of your blog entries word-for-word and at least skim all of them, and I really appreciate the knowledge and talent and care you put into every word and picture. I read your personal update and am sending you the strongest healing thoughts I can muster! Thank you for being such a positive and hopeful presence on the internet! Congratulations, KerGiz! Lorraine’s overdyes are to dye for! Thank you for the update, Mary. I did get a chuckle out of the Benadryl/steroids thing. ‘Tis but too true! Continuing to send positive vibes your way. So glad to hear your treatments are almost completed, and that you are feeling so well….for the most part. You are such a positive person and I admire the way you encourage us all to stay positive and carry on! Loving thoughts your way. Dearest Mary, you got me started with exploration and self teaching of all things embroidery. For that I am immensely grateful. Knowing that as long as I have fingers & eyes I will never be bored because there is always a piece of cloth and some threads begging to be used. Heartfelt prayers for your continued improvement. Thanks for the update on your cancer treatments. And thanks for letting us know about the sale. I managed to get a few things. Congratulations to the winner! On a personal note – I’m glad to hear that your treatment plan is nearing an end. Another couple of rough weeks and then you’re done. Hang in there Mary – we’re all praying for you. Mary, many thanks for the update. It must be such a relief to see the end of treatment coming closer, with the promise that you can be your own person again at last. I hope the beautiful Kansas spring helps your spirit soar through the next few weeks. Thank you for sharing your ongoing story with us. I know you are looking forward to ending this medical problem with the final treatment in May. If good wishes and love have anything to do with great outcomes, you will be wonderfully successful and have a full and permanent recovery. Best wishes for a great weekend, and a fast forward to June! It is good to hear that most of your treatment has passed, and that you are still in high spirits. All our love and thoughts and good wishes go with you. Keep smiling and charged up, it is better than feeling sorry for yourself. Love and warm wishes go to you. Yes, we do all care so much about you. You’ve brightened our lives with your cheery and informative posts. Hang in there! Just find your site and I am looking forward to reading every entry! Blessings to you. Welcome aboard, Lydia! I hope you enjoy Needle ‘n Thread! Thank you for keeping us updated. Here’s to good health in your future! Thank you so much for the update! You’re still an inspiration, both personally and professionally! So very pleased to read that your treatment is going well. I do look forward to enjoying your website for many years to come. All the best with this last round of chemo and I will keep my fingers crossed that everything continues to go well. Mary…my congrats to the winner of the wonderful threads! And congrats to you for getting through what looks like almost 2/3rd of your treatments and keeping your bright attitude here in your postings about stitching! I look forward to reading your various installments on stitching adventures…and thanks for the updates on your health. You are in my daily prayers for strength and courage as you face each new day! Mary , I,m so glad that you seem to be keeping mentally strong through it all. You’re in my prayers too . Thank you for the update, and it’s great that the sessions are nearly done. You are in my prayers and I’m glad to hear your upbeat attitude. Keep healing and get better, Mary. Thank you also for the giveaway contest. I S-O wanted to win those threads! Oh, well, someone else will enjoy them and that’s great! And prayers for you, Mary. Thank you for giving so much of yourself to us to teach us new embroidery techniques. Hi Mary, Thank you for your update and you are an inspiration to so many!! You are always in my prayers!! Hi Mary. I am so glad to see you so positive as you undergo your treatments. I have my fingers crossed for you, hoping that your last couple of treatments are not too terrible, and of course (!) that your cancer is finally beaten. Thank you for sharing a part of you, through adversity you still maintain an positive outlook and inspire us all. God Bless, you are in my prayers. Many thanks for the update! Lots of prayers and love continuing to come your way! Mary you have such a healthy attitude. I worry for people who constantly believe that everyone around them has it so good. You never know what someone is going through or what they’ve been through to get where they are. I’m having some minor health issues at the moment, you’re having some serious ones and hundreds of others are currently nearing the end of their days in a hospital or hospice somewhere. To be mindful of others is a wonderful thing. I wish you all the surges of energy that you can get. Hey — I know you wrote on The Silk Mill in France with their lovely colors!!! Sale for the next three days — get some themed group and get a Spring group for free — that is like 14 colors for free. I recommend hopping out and checking it. Very lovely and reasonable prices! Even with the exchange rate.